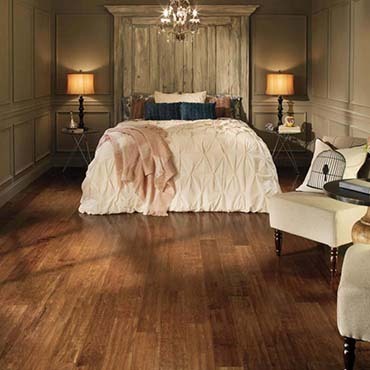 Columbia Laminate Flooring... Your Home, Your Style... If you're looking for a style every family member can love, the choice is one of the Clic collections available from Columbia Laminate Flooring. Installation is quick and easy, creating a strong, durable product that's warranted for a lifetime of active family living. Available in a wide range of patterns and colors, with revolutionary textures and embossing. Columbia Laminate Flooring gives you the look of hardwood with easy maintenance, so you can spend more time enjoying your space and less time maintaining it. The top layer would consist of a transparent scratch and stain resistant wear layer with a high taber (wear-resistance) value. Next would be the design layer, a melamine resin impregnated paper, having various patterns and designs ranging from wood-grains to stone to even more imaginative and decorative type designs. Then would come the core, which would be constructed of a high quality, high density fiberboard, manufactured with a water resistant glue. Finally would be the stabilizing layer or balancing layer. This layer is also impregnated with melamine resin and is of a thickness to balance the product, thus eliminating "cupping" or "warping". A system that takes less time, less effort and gives you immediate results? You bet! Installing has never been easier, even when compared to the next easiest method: a glued system. Plus, they give your new space that finished appearance by using co-ordinated moldings. Then keep it all looking just like new with their cleaner. Check with your retailer for your complete installation and maintenance needs. Their original Clic product, combines performance and beauty. Nobody beats its lifetime warranty, and when this assurance is combined with their new, rich NatureTex™ and SurfaceTex™ finishes, Clic offer an inviting touch that says "welcome to my home." With 18 colors of various style and textures available, you are certain to find that product which complements your décor. This manufacturer brings over 40 years of expertise in hardwood veneers to every product they make, with the singular goal of bringing out the exceptional beauty and natural warmth of every piece of wood. And the pride in their work translates into your own pride in your home.